Sen. Bam Aquino chided the Bureau of Customs (BOC) for making it easy for big-time smugglers to bring in contrabands into the country while burdening overseas Filipino workers (OFWs) with strict requirements in the entry of Balikbayan boxes. 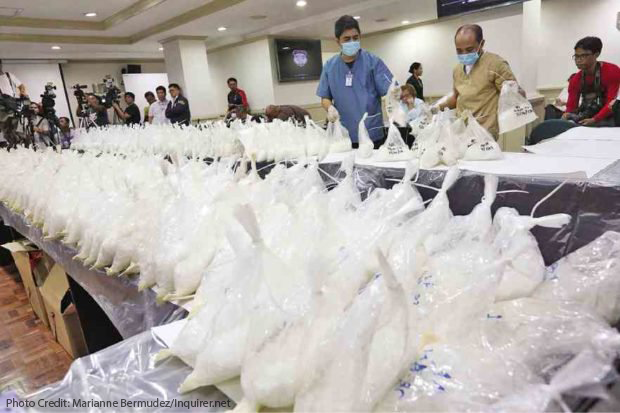 “Habang pinapahirapan ang mga OFWs na magpadala ng gamit sa kanilang mahal sa buhay, labas-masok naman ang kontrabando sa Super Green Lane (SGL),” said Sen. Bam, referring to the P6.4 billion shabu shipment what was allowed to pass through the Super Green Lanes (SGL). To help prevent port congestion, Super Green Lanes were put in place to allow fast tracking of shipments based on the discretion of the BOC. “Ito ba ang direksiyon ng BOC para maresolba ang problema sa smuggling? Pahirapan ang mga OFWs at palagpasin ang mga big time smugglers?” asked Sen. Bam, adding that the intention of SGL to facilitate transaction with exporters and importers was put in a bad light due to this incident. “Ilan pa kayang kontrabando at droga ang nakakalusot sa mga Super Green Lanes natin?” questioned Sen. Bam. Sen. Bam further criticized the BOC’s new rules on how overseas Filipino can send home a balikbayan box, including the pasting on the box a detailed list of contents and putting the receipts of items purchased inside. “They leave the country to provide for their family and they keep our economy afloat. The government should allow them their privileges. They do not deserve the additional hassles and harassment,” said Sen. Bam. Sen. Bam was the co-author of the Customs Modernization and Tariff Act of 2016, which allows OFWs to send up to three P150,000-worth of tax and duty free balikbayan boxes in a year, given that goods are not in commercial quantities nor intended for barter, sale or for hire. The senator also pushed for the increase in the value of de minimis from P10 to P10,000 through his Senate Bill No. 2373. 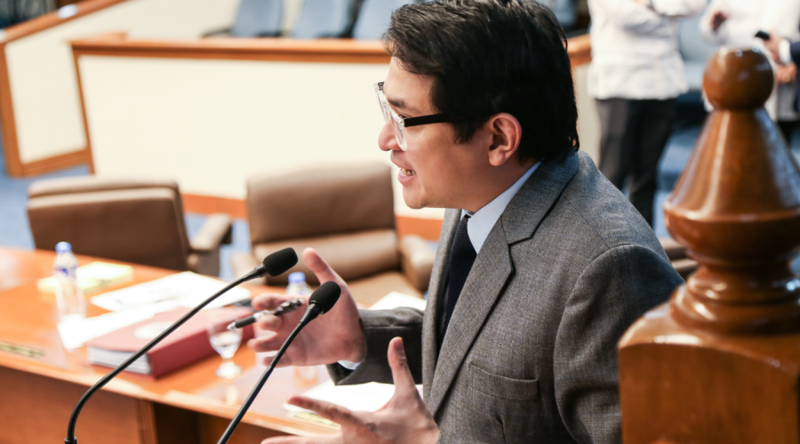 Sen. Bam Aquino is set to conduct a hearing into the effects of artificial intelligence (AI) to jobs in the country. “Every job created for Filipinos is important. We have to guard against trends that will take jobs away from our countrymen,” said Sen. Bam, who will conduct the probe on Tuesday (August 1) as chairman of the Committee on Science and Technology. “Gusto nating malaman kung ano ang epekto ng artificial intelligence sa employment, lalo na sa ating business process outsourcing (BPO) o call center sector,” added Sen. Bam. Sen. Bam filed Senate Resolution No. 344, to conduct an inquiry on the government’s plan and initiatives to maximize the benefits of developments in artificial intelligence and other emerging technologies. The senator expressed alarm over the growing presence of Chatbots and the emergence of systems capable of referring questions to human operators and learning from their responses. 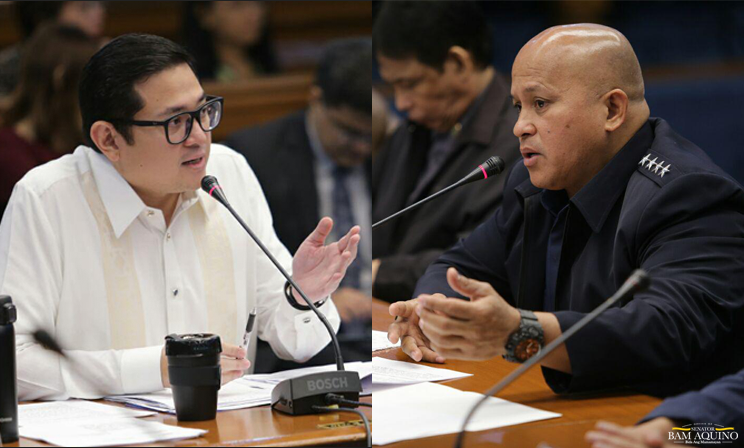 “These systems use artificial intelligence and are capable of performing the tasks of human employees, putting their livelihood at risk, especially in the call center industry,” said Sen. Bam. In 2016, the International Labor Organization (ILO) reported that 49 percent of all employment in the Philippines faces a high risk of automation in the next couple of decades. Based on research conducted by International Data Corporation (IDC), around $47 billion will be spent on AI-related applications globally by 2020, especially in banking, healthcare and retail sectors. 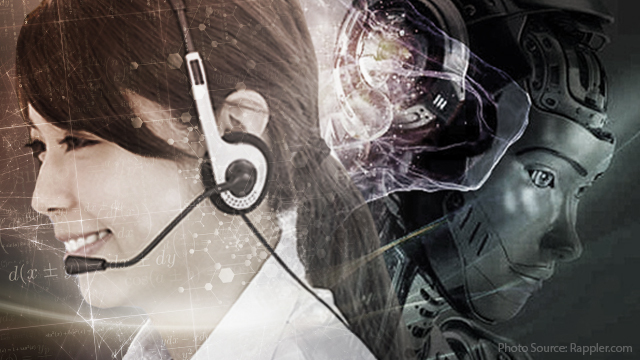 According to Jubert Daniel Alberto of IDC Philippines, the rise of AI will definitely affect the BPO industry that currently employs around 1.2 million Filipinos. Sen. Bam Aquino joined the training of the Filipino DOTA team TNC Pro before it travels to Seattle, Washington Sunday to participate in The International DOTA 2 Championships, the biggest esports event in the world. “It’s not every day that you get to play with the best in the world so it was a big honor that I was allowed to join their practice before they travel to Seattle tomorrow (Sunday),” said Sen. Bam, who joined TNC Pro’s practice session when he visited the group’s DOTA Gaming House. After placing in the eighth among 18 teams in last year’s edition of the tournament, Sen. Bam believes that the team can do even better this year. The members of TNC Pro are Theeban “1437” Siva, Carlo “Kuku” Palad, Sam “Samh” Hidalgo, Marco Polo Luis “Raven” Fausto and Timothy John “Tims” Randrup. “These gentlemen play with a lot of skill and talent, and they also play with a lot of Pinoy pride,” said Sen. Bam, who also wished Team Execration, the other Filipino team in the tournament, the best of luck. Sen. Bam provided help in the travel of TNC Pro, the winner in the Southeast Asian qualifying event while Execration placed third behind Fnatic. The two Filipino squads will battle it out against the best of Europe (Team Secret, HellRaisers and Team Empire), China (iG Vitality, LGD.Forever Young and LGD Gaming), North America (Cloud9 and Digital Chaos), South America (Infamous) and direct invites OG, Virtus.Pro, Evil Geniuses, Team Liquid, Invictus Gaming and Newbee. The tournament offers a total purse of $22,810,242. 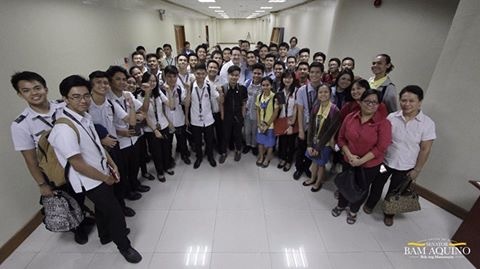 Sen. Bam is a supporter of Filipino esports athletes and game development in the Philippines for its huge potential in bringing honor to the country and creating jobs and livelihood for Filipinos. The senator helped establish Philippine esports Association (PeSPA) to strengthen the foundation of esports in the country, look after the welfare of cyber athletes and stakeholders and promote esports in the country. Sen. Bam Aquino lauded the sign language interpreters for making President Duterte’s State of the Nation Address (SONA) accessible to our deaf countrymen even as he pushed for the passage of Senate Bill No. 966 or the Filipino Sign Language Act. “Nagpapasalamat tayo sa sign language interpreters sa SONA sa kanilang pagsisikap na maihatid ang mensahe ng ating Pangulo sa ating mga kababayang bingi,” said Sen. Bam, author of Senate Bill No. 966. The measure seeks to declare Filipino Sign Language (FSL) as the national sign language of the Filipino Deaf and the official language of the Philippine government in all transactions with the Deaf. In addition, the measure also mandates the use of FSL in schools, workplaces, and broadcast media. In his four years as lawmaker, Sen. Bam has tirelessly worked for the welfare of persons with disabilities (PWDs) by pushing the passage of Republic Act 10754, which exempts PWDs from paying value added tax (VAT), in the 16th Congress as co-author. He also worked for the passage of Republic Act 10905 or the Closed Caption Law as co-author. It requires television networks to use the closed captioning system for news and current affairs programs and entertainment shows for the benefit of viewers with hearing impairment. In the 17th Congress, Sen. Bam filed Senate Bill No. 967 requiring Filipino Sign Language insets for local news programs. He also filed Senate Bill No. 1249 seeking to mandate government offices and private companies to allocate a percentage of their workforce for PWDs. Under the bill, which seeks to amend Republic Act 7277 or the Magna Carta for Disabled Persons, government agencies are mandated to ensure that two percent of their employees comprise of PWDs. Private organizations, for their part, will be required to employ one percent of their workforce from PWDs. 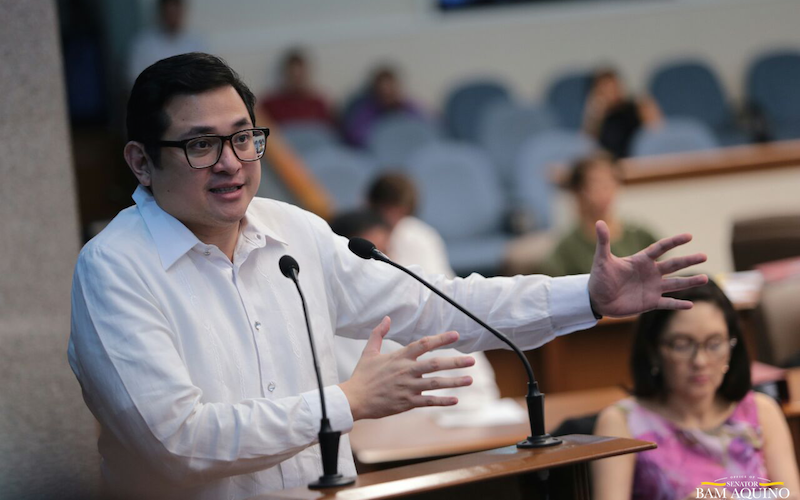 Sen. Bam Aquino expressed support behind the Senate leadership’s plan to convene as a committee of the whole to discuss the tax reform package being pushed by the Duterte administration. The senator said that the committee of the whole can give senators a venue to raise these concerns. Earlier, President Duterte asked Senate to pass the government’s tax reform package in its entirety during his State of the Nation Address (SONA). However, Sen. Bam said the Senate owes it to the people to go over the measure with a ‘fine-toothed comb” to determine the impact of each provision to prices of commodities, jobs and other economic issues. “Ang pagtaas ng presyo ng bilihin ay seryosong bagay at nararapat lang na gawin ng Senado ang aming tungkulin bilang kinatawan ng taumbayan na suriin ang mga panukalang ito,” said Sen. Bam. “Interesado ako sa mga probisyon na posibleng makapagtaas sa presyo ng bilihin tulad ng bigas. We don’t want our people to suffer from higher prices of commodities,” he added. Sen. Bam also promised to scrutinize provisions that will affect employment of Filipinos, such as business process outsourcing or call centers, and the competitiveness of industries and the agriculture sector such as the sugar industry. “Some farmers groups have already raised concerns on excise tax on sugar and sweetened beverages because it will affect their livelihood,” said Sen. Bam. Sen. Bam also wants to determine the economic impact of each provision of the tax reform package and not just the projected amount of tax that will be collected from it. As part of his efforts to reduce personal income tax rate, Sen. Bam has filed Senate Bill No. 697 that seeks to revise the current income tax bracket set by the National Internal Revenue Code, which was passed in 1997. The measure seeks to amend Section 24 of the National Internal Revenue Code of 1997, as amended, by adjusting the levels of net taxable income and simplifying the nominal tax rates for the purposes of computing the individual income tax. Sen. Bam is also pushing to lower taxes for small business through Senate Bill No. 169 or the Small Business Tax Reform Act. This measure is an investment in the future of our youth and in the Filipino family. This measure allows more Filipinos to afford a college education or technical-vocational course, which should open up more opportunities for employment and livelihood. A free tertiary education also relieves parents and breadwinners of a major expense, allowing them to spend on other needs, like healthcare and housing, or set aside more for savings. Who will get free tuition in the current version of the law? All students who are enrolled or will enroll in State Universities and Colleges (SUCs), accredited Local Universities and Colleges (LUCs), and publicly-run Technical-Vocational Institutions (TVIs) are entitled to a tuition and other fees-free education as long as they fulfill the admission and retention standards of the schools and this measure. Who are not eligible to a tuition-free post secondary education? Students who failed to complete the degree program within a year more after the prescribed period of the program are no longer qualified for the free tuition. Students who failed any course within the techvoc program. The students in this list can still enroll in their respective schools, but they would have to pay for the tuition and other fees. What is StuFAP? What does it cover? Student Financial Assistance Programs (StuFAPs) are programs that provide financial assistance to students. StuFAPs come in 3 forms- scholarships, grant-in-aid programs, and student loans. The Tertiary Education Subsidy (TES) for Filipino Students is a fund that is created to strengthen the StuFAPs. This will be the fund that will be utilized to provide assistance to students in need who are enrolled in higher education institutions. This will be administered by the Unified Financial Assistance System for Tertiary Education (UniFAST). Accessing this fund is different from the free tuition scheme in SUCs, LUCs, and state-run TVIs. What is the loan program? One of the new features of the bill is the creation of a pool of money for student loans. The student loan program will be available to all Filipinos to supplement other costs that are brought about by studying in a Higher Education Institution (HEI) or TVI or to address unexpected situations to ensure that students will not drop out of school. This pool of money will be facilitated by the UniFAST. What is the status of the bill? When will this be rolled out? The legislators intend for the law to be implemented in time for the second semester 2017-2018. It is true that only 12% of the poorest of the poor are in SUCs. The large percent of the poorest of the poor aren’t in college because of financial and other limitations. But what the bill hopes to do is support the majority of SUC students who may not be of the “poorest of the poor” but still face financial difficulties in paying for a higher education. 49% of students in SUCs come from the bottom 50% of the population, from income levels determined by PIDS to need full support (tuition + other educational expenses + living allowance) to finish college. Up to 71% of students in SUCs come from families that do not have disposable income, with monthly family income of approx. P27,000 or less. Their families are struggling to send their children to school. On the other hand, only up to 28% of students in SUCs come from families that can COMFORTABLY send ONE child to school, with monthly family income of more than P29,000. Only up to 17% of students in SUCs come from families with monthly family income higher than P40,000. Only up to 7% of students in SUCs come from families with monthly family income of more than P78,000. Based on another report from Philippine Association of State Universities and Colleges (PASUC) providing data from 58 SUCs, 77% of students enrolled in SUCs have family income within the minimum wage range or lower. Based on APIS 2014, 40.7% of students aged 16 to 17 will not continue their studies because of financial concerns or high cost of education. This is the reason why only 1 out of 4 students who enter college will graduate. SUC students who can afford the tuition have the option to opt-out of free tuition, and pay the full tuition fee instead. 2) We need to focus on basic education before we focus on college-level. We are not taking away any of the budget from K-12 implementation. The budget that is allocated for K-12 implementation, as coursed through the Department of Education, will remain intact to continue improving basic education facilities like building more classrooms, hiring more teachers, and improving the overall quality of K-12 delivery. The budget for free tuition in SUCs will come through a different budget allocation and will be coursed through CHED and SUCs. Reforms in the higher education sector are complementary to the reforms in the basic education. 3) Students and their families won’t value their education anymore because it’s free. Students are still subject to admission and retention standards of the schools they enroll in and will not be able to avail of their free education should they get a failing mark. Students would need to pass their subjects and study hard to secure that college diploma. We are hopeful that students will value their education not just because of how much money was spent but also because of the opportunities it will open up once students graduate. Many Filipino families believe that a college education is key to unlocking higher paying jobs and a more prosperous future. 4) SUCs will have less money for salaries. Salaries of SUC staff come from the budget for Personal Services, which each SUC receives directly from the General Appropriations Act. The SUCs will receive their budget, including the budget for free tuition and miscellaneous fees, from the Department of Budget and Management (DBM). SUCs will still receive the same amount of money that they would receive if they were collecting tuition from students. 5) SUCs might raise miscellaneous fees to earn money from students. SUCs and government-run TVIs will not be allowed to charge the students with tuition and other fees, including miscellaneous fees. 6) Is Universal Access to Quality Tertiary Education Act sustainable? As long as education remains a priority, the government should be able to allocate a budget for free college education. Due to the economic performance of our country in the past years, we are now enjoying a more robust budget. Our budget is set to grow by around 10% annually and the money used for subsidizing higher education for all SUC students is only a fraction in the increase in national budget. Lastly, almost all Senators are committed to push for this bill, and since the power of the purse is in Congress, it means a commitment to allocate funding in the next budget cycle. 1) Can I still apply for other scholarships, grants in aid and loan? Yes. To cover book costs, transport, board and lodging, etcetera, you can still apply for other scholarships through different StuFAP programs or private scholarships. The free tuition does not prevent you from applying for other scholarships. 2) What if I do not pass the entrance exam? Puwede bang magbayad na lang ng tuition fee? No. To enter the university you must pass the entrance examination even if you will opt-out of the free tuition and pay. 3) SUCs might start accepting too many students, bringing down the quality of education. SUCs will not be allowed to accept more students than their facilities and teaching staff can handle. They are limited to their currently set student population, until they can justify the expansion of their facilities. If the SUC wants to increase their student population, they would need to defend it before Congress and CHED during their budget deliberations. 1) Can SUCs still apply for other budget allocation for our school? Yes! SUCs can still apply for capital outlays, maintenance and other operating expenses, and personnel services by submitting a proposal during the deliberation period for the General Appropriations Act (the National Budget) for whatever expansion or project your school has. For Local Universities and Colleges, the primary source of the budget will still be from the local council. If qualified, the CHED will just cover the tuition and other fees of students enrolled, but the rest of the expenses will still be sourced through the local council. For TVIs, the budget will still be under the TESDA. Acquisition of new equipment or expansion of a program will still be the discretion of the head agency. 2) Where do the schools get the tuition allocation? The SUCs will receive their budget directly from DBM. The budget for LUCs will be coursed through CHED. And the budget for TVIs will be coursed through TESDA. The return of Supt. Marvin Marcos and his men to service sends a bad signal to the public that anyone can get away with any wrongdoing, including murder, as long as they have close ties with high officials of the country, according to Sen. Bam Aquino. “What signal does this send? Kapag gumawa ka ng mali, as long as okay ka sa taas, ibabalik ka sa puwesto. That’s the signal being sent to the public,” said Sen. Bam during the hearing of the Committee on Public Order and Illegal Drugs on the downgrading of the murder case against Marcos and his men and their subsequent return to service. According to Sen. Bam, the downgrading of the case against Marcos and company by Department of Justice (DOJ) Undersecretary Reynante Orceo came as a shock. “The NBI report, the PNP-IAS report, the Senate report, the analysis of the medico-legal, and the original DOJ Panel Report – all point to murder. Bakit binaba to homicide? Bakit may reinstatement?” Sen. Bam asked DOJ Usec. Orceo and PNP Chief Ronald Dela Rosa. For their part, the NBI represented by Director Dante Gierran and the DOJ panel of prosecutors represented by Sr. Asst. State Prosecutor Lilian Doris Alejo, reaffirmed their conclusions in their reports, that the Espinosa slay was clearly premeditated and that murder charges should be filed against suspected members of the PNP. “We were shocked on the news of the downgrade, pero mas shocking iyong reinstatement,” added the senator, who also questioned the PNP chief on why he did not put Marcos and other police personnel involved on floating status or in the office instead of bringing them back to the field. “Thanks to the downgrade to homicide, these murder suspects are out on bail and are back on the field. Why are we risking the credibility of the police force for these individuals?” questioned Sen. Bam. Sen. Bam Aquino raised this question as he expressed disappointment over President Duterte’s failure to mention free college education in his State of the Nation Address (SONA). “Marami pong umasa na babanggitin ni Pangulong Duterte ang napakaimportanteng repormang ito na magbibigay ng libreng edukasyon sa milyon-milyong Pilipino, lalo pa’t pirma na lang niya ang kulang upang ito’y maisabatas. Nakakapanghinayang na hindi ito binanggit,” said Sen. Bam. Sen. Bam is still hopeful though that the president will decide to sign this bill into law. 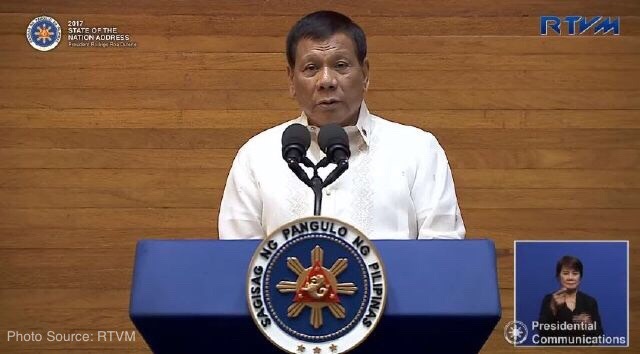 He also mentioned he was happy with some pronouncements during the SONA, including enhancing support for the Armed Forces, improving government efficiency, providing free internet in public spaces which he also sponsored, and some legislative measures like the Land Use Act, BBL, as well as changes in mining policies. But the senator stressed the need to prioritize free education and give more Filipinos access to a college degree and a brighter future. “Isabatas na sana ang panukalang ito sa lalong madaling panahon,” said Sen. Bam. Sen. Bam is the principal sponsor and co-author of two measures up for the President’s signature, the Universal Access to Quality Tertiary Education Act and the Free Internet in Public Spaces Act. Once enacted into law, the Universal Access to Quality Tertiary Education Act will institutionalize free tuition and other fees in SUCs and LUCs all over the country, giving underprivileged students a chance to earn a college degree. On the other hand, the Free Internet in Public Places measure will provide free internet access in all national and local government offices, public schools, public transport terminals, public hospitals and public libraries. Under the measure, the Department of Information and Communications Technology (DICT) will be mandated to craft a plan and a timeline for the rollout of this program. Sen. Bam Aquino assured the public that the Senate will put the tax reform package being pushed by the Duterte administration under the microscope, saying lawmakers owe it to the people. “Pagdating sa tax reform package, mukhang mahaba-haba pa ang mangyayaring debate tungkol dito,” said Sen. Bam, vice chairman of the Committee on Ways and Means. “We owe it to the Filipino people na kilatisin iyon kasi at the end of the day, tataas ang presyo ng bilihin dahil sa panukalang ito,” stressed Sen. Bam, adding that the Senate cannot accede to the President request to pass the tax reform package in total. In an earlier interview, Sen. Bam warned that the government’s plan of imposing excise tax on liquefied petroleum gas, gasoline and diesel under its tax reform package will lead to higher prices of commodities. “The excise tax on LPG, gasoline and diesel will raise prices eventually. It might be inflationary because everything is transported. This will affect the pockets of our countrymen,” said Sen. Bam. However, Sen. Bam said he supports the move to reduce personal income tax rate, saying it was part of his advocacy when he became a senator. “Hindi naman tama na iyong CEO at kanyang secretary ay parehong kinakaltasan ng 32 percent na income tax,” said Sen. Bam. In the 17th Congress, Sen. Bam has filed Senate Bill No. 697 that seeks to revise the current income tax bracket set by the National Internal Revenue Code, which was passed in 1997.